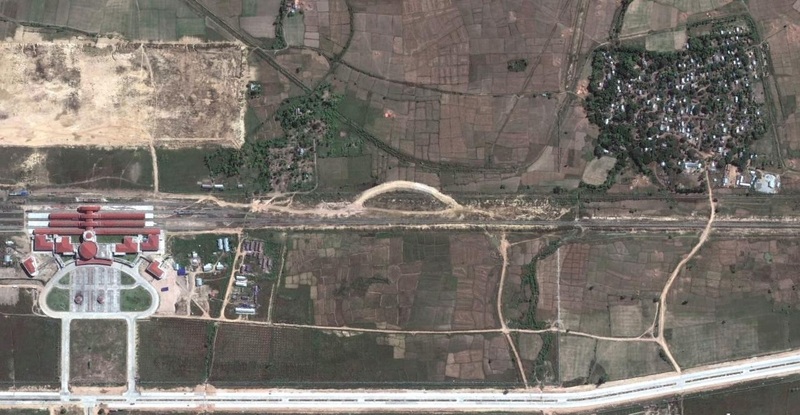 In 2007, Siddharth Varadarajan described the city of Naypyidaw (Abode of Kings) as "the ultimate insurance against regime change, a masterpiece of urban planning designed to defeat any putative 'colour revolution' — not by tanks and water cannons, but by geometry and cartography." Less than two years prior, this brand-new outpost became the capital of Myanmar through a process shrouded in mystery. Based on astrological counsel, as the story goes, a convoy of 1,100 military vehicles carrying 11 battalions and 11 ministries left Yangon for Naypyidaw on November 11, 2005, at 11 a.m. General Than Shwe, leader of the junta in power at the time, justified this move as a solution to expanding government facilities without exacerbating congestion in Yangon. Information Minister Kyaw Hsan added that the government sought to place the capital in a strategically central location. 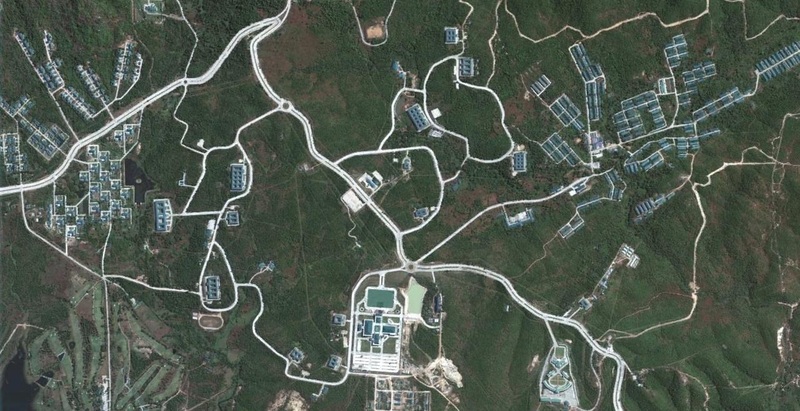 Military planners rapidly developed Naypyidaw with little if any input from civil society. Following the release of pro-democracy activist Aung San Suu Kyi from twenty years of house arrest, in 2010, a series of political reforms took effect in Myanmar. A civilian government succeeded the military regime in 2011, and Suu Kyi's party — the National League for Democracy — won 43 of 45 seats in the Lower House of Parliament a year later. It is unclear whether the former leaders, who have retained substantial influence, built the new capital in preparation for these changes. 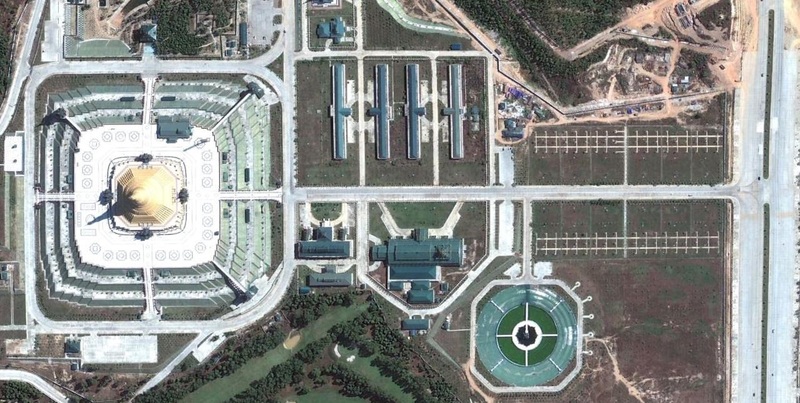 Unlike the famous modernist plans for Brasilia and Chandigarh, Naypyidaw lacks a clearly articulated form. 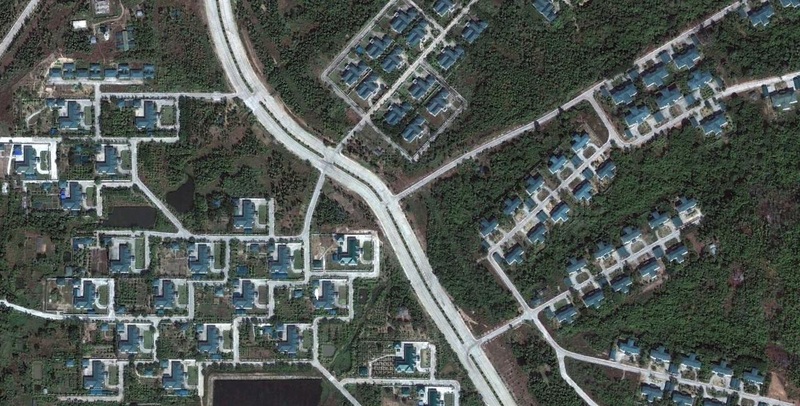 Its structures are idiosyncratically arranged in low-density clusters linked by giant roadways. Architectural monotony is evident from above in the shapes and colors of residential development. The capital's public buildings include a central parliamentary complex, an international airport and a massive pagoda. Their designs tend to feature grandiose symmetry around a central axis. Most are located far from residential areas, in keeping with the general scarcity of mixed-use development in Naypyidaw. Uppatasanti Pagoda (Peace Pagoda), at left, is Naypyidaw's largest monument. Rare mixed-use development around the Gems Museum. 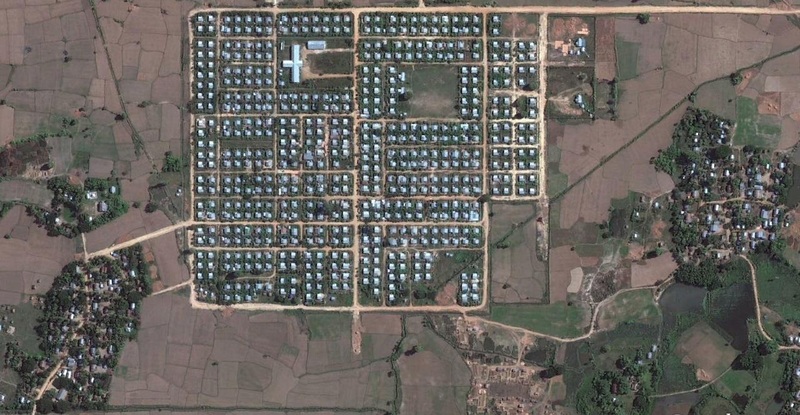 The town of Pyinmana, about two miles from Naypyidaw, exemplifies the organic density of most settlements in Myanmar. By contrast, the new capital is a luxurious sprawling garrison. Its costly architecture and amenities underscore longstanding deprivation that still plagues the country in spite of government reforms. The town of Pyinmana, located a few miles from Naypyidaw. 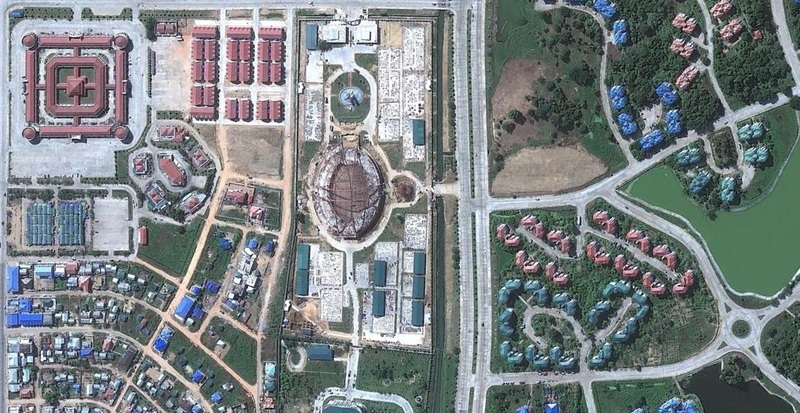 Naypyidaw Railway Station (above left) and other new development (below center) in comparison with nearby settlements. Naypyidaw does not reflect an explicit social model or policy aimed at improving the lives of Myanmar residents as a whole. Still, it is growing haphazardly with the arrival of migrants in search of employment. Such opportunities are extremely limited in other areas due to inadequate public and private investment. As a result, informal settlements will likely expand around Naypyidaw as persistently as they have around Brasilia and Chandigarh. Myanmar's capital is oriented, above all, toward the interests of a small group of military leaders. Government reforms may eventually improve conditions for the broader populace, but a vital question remains: will current leaders allow people outside their ranks to play a meaningful role in urban planning? 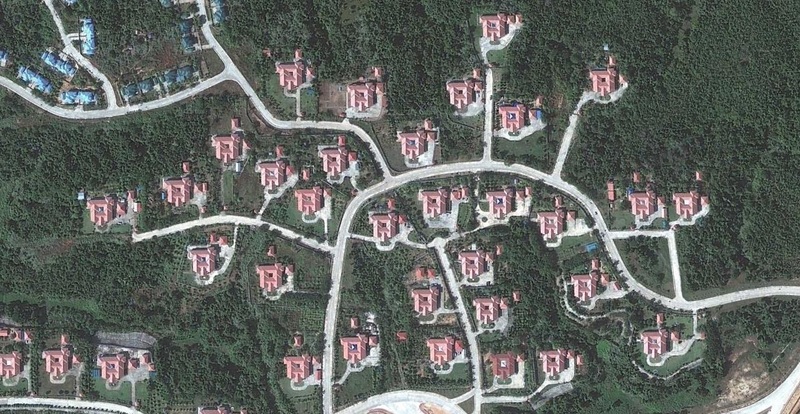 Credits: Satellite images captured from Google Earth. Those are probably the widest streets I've ever seen. Building this city seems an incredibly extreme reaction to supposed internal and external threats. Nationalist authoritarian isolation, though, is hardly an effective way of ensuring longterm stability. It's so important not to fear open governance, to let it improve through practice. That's a classic justification for authoritarian rule. There's truth in it, but so often it's used in order to keep a certain 'elite' in power no matter how incompetent or abusive they become. I think they mean that rhetoric about open governance, freedom, even democracy, also too often benefits a so called elite. Only if it's just rhetoric. Otherwise it helps avoid projects like the one above. I read somewhere that there's even a tunnel system under the city for defense. Architecture of fear. military values can inspire responsibility, independence, pride, concern for others who are on the same side, unity in pursuing common goals. in this sense discipline is freedom. OK, but for globally divisive ends, with real danger of lapsing into xenophobia and totalitarianism. There are better ways to engender those values. Thanks for the debate! Please always share your thoughts! I appreciate this background as the current election results come in. It will be very interesting to see how it plays out and what's in store for Naypyidaw.